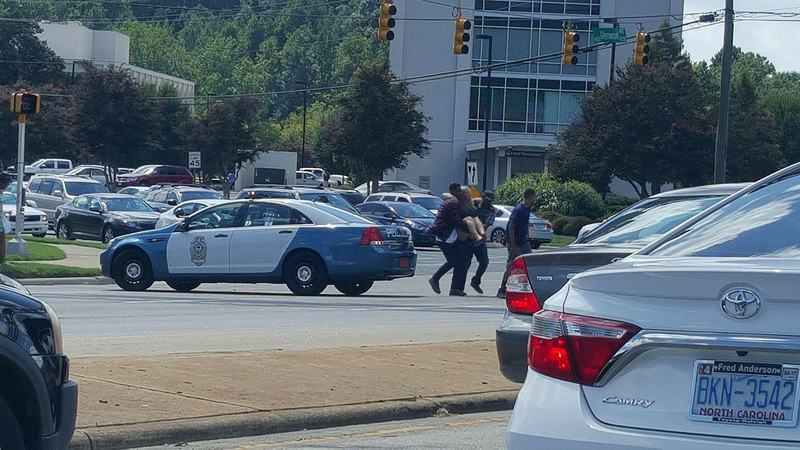 RALEIGH -- Crabtree Valley Mall in Raleigh was placed on lockdown Saturday afternoon, mall officials said. They did not give a reason why. Multiple eyewitnesses said there was a shooting. Police have not confirmed if that is accurate. ABC11 talked to Mark Rush, an eyewitness who said he was only 10 or 15 feet from the incident. He said he heard about 5 or 6 shots as he was walking out of a cell phone accessory store. He said he was with his family and that "it was probably the scariest thing he went through in his life." He said he grabbed his stroller and his family and ran out of the mall. Other eyewitnesses said they had to run out of the mall as well. ABC11 spoke to a woman who was in the food court when the incident happened. She said they heard "something pop" and then "pandemonium broke out." She said people were running over tables and chairs to get out of the mall. The eyewitness in the food court said she "played dead" with her kids and then someone urged her to get out of the mall. The information in this tweet is not confirmed. Stay with ABC7 News for the latest details on this developing story.